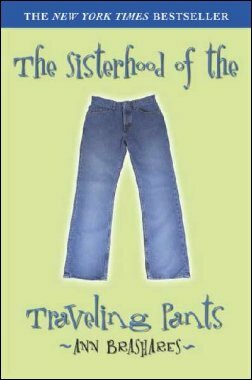 The adage "Wherever you go, there you are" is not simply a cliché in the first novel of the young adult series The Sisterhood of the Traveling Pants, by Ann Brashares. A pair of secondhand blue jeans acts as a device to fuse together the stories of four very different summer experiences amongst four best friends. However, even without the blue jeans, the connection between the girls is apparent as they each struggle to find themselves and come to terms with their distinct personalities. There is Carmen, precocious and half Puerto Rican, who meets her step-family for the first time, and experiences commonplace feelings of disappointment as though her father has truly replaced and forgotten about his relationship to her and her mother. Lena, on the other hand, travels to Greece, and for the first time becomes comfortable with her introspective, artistic nature through the help of her Old World grandparents and a very friendly native. Bridget, the coquette of the group, flirts her way through soccer camp and fleetingly locks eyes with the handsome instructor. However, it is Tibby who provides the central focus of the story, as she remains at home, believing herself to be trapped working at the local convenience store for the entire summer while dreaming of a career in documentary film. Her slow summer break takes a dramatic turn when she allows an unexpected stranger to enter briefly into her life. The story that Brashares presents within the first Sisterhood novel fully absorbs the reader through the stark humanness of her characters, revealed through the character development of Bridget who lost her mother at a young age, to the passive-aggressive (but nevertheless honest) manner in which Carmen reacts to her father's "new" family. For those reading the novel who are older than high school age, it provides worthy nostalgia back to a time where endless possibility existed for what one's life will be; as it is universally understood, encompassing this sense of possibility lies confusion and self-doubt. Brashares captures these feelings through the behavior of her characters as we watch them make mistakes and irrational decisions; the notions of realism and introspection are the marks of a truly valid work in the coming-of-age genre. I give this book 5 stars (of a possible 5).